So, the other night, the boy had his locker at the gym broken into while he was working out. They stole his pants, which had his keys, wallet and cell phone in the pockets. The cops came, he filed a report. He called me from the gym as I was waiting to meet him for dinner and a movie. I went to pick him up, then drove him up to his house (35 minutes away from the gym) got his spare car key, canceled all of his credit cards, barricaded the doors, told his neighbors so they could keep an eye out on his house, drove BACK to the gym, got his car, put gas in my car and we did not get home until after 9. There went our plans for the night. We were told the GM from the gym would call either the boy at work yesterday or me on my cell phone. Nothing. We need to replace the boys cell phone which I was just told by our carrier is going to cost us at a minimum $220, to replace his phone $299. Nice. He had to take the day off today to replace his drivers license, change his locks and have keys made. We also still need to get him a phone. I called the GM this morning, not in, left a VM, but seriously, what a pain. The locks that they have at the gym are the kind that you slide your card through and then turn the key on the locker and take it with you, so in a sense, the gym has provided the security for the lockers. I am really disappointed that they have not called on this, there were two other lockers broken into at the same time. This is such a huge inconvenience and a total pain, I seriously hate criminals. So, tonight I guess it will be replace his phone and then grab a bite to eat and look for something for me to wear for tomorrow nights gala. Our plans this week have been pretty screwed up, but other than the robbery it has been a pretty good week. Tuesday night we went to a local restaurant where we were invited to an event for event planners. I am the Director of Programs and Arrangements for JLM next year, so that along with my wine club, we figured it was perfect. I met the boy there which worked out well too. They had some great sushi, pasta and desserts as well as some nice wine paired with it. Last night though we saw our first movie screening in a LONG time. We have been pretty busy lately so this was a nice treat. We met for dinner at Big Bowl which in the past the boy has always poo poohed because he had been there once a long time ago and he wasn't a fan. But I was just craving it last night, so we went. It was REALLY good and after a really stressful day at work it was nice to sit down with a glass of wine and have a bite to eat. I will say though that it was on the more expensive side for us for a week night meal out. The movie was SO cute, I just loved it! I really enjoy Amanda Seyfried, she is just adorable! I have hair envy, her hair in every scene was just gorgeous! Vanessa Redgrave is just classic, timeless and stunning. The storyline is sweet and endearing, but the scenery, oh the scenery was just gorgeous. The movie takes place in Verona, Italy, I wanted to just transport myself there that instant. All amongst the vineyards, oh, I cannot even explain how gorgeous it was. Definitely a chick flick. 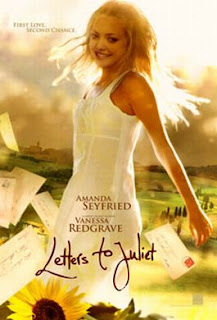 Definitely one of the most romantic films I have seen in a long time, love that Amanda Seyfried, go see it!